I don’t know how long he had been floating but it was obvious, our beta fish had passed away. 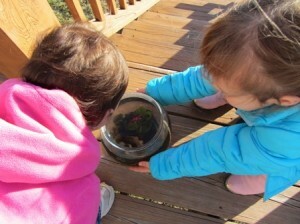 After I broke the news to my three girls, it was time to bury our beloved (often neglected) fish, Goldie. When Mom is a gardener, the fish does not get flushed, it gets buried deep in the compost pile. Morbid I know, but fish emulsion and fish meal are common garden fertilizers and the little ‘ole fish will add nutrients to our compost. You are not supposed to put meat in your compost pile because it will draw rodents. I went ahead and buried Goldie deep in the middle, hoping the mice won’t sniff him out. Since we are on the topic of fish, I thought it time I blog about fertilizing with fish emulsion and/or fish meal. As gardeners, we know that soil fertility is key to promoting vigorous plant growth and development. When it’s time to replenish nutrients to my garden soil, I grab my purse and head to my favorite garden center (always looking for an excuse to pop in and see what’s new). This is after, I have applied my compost and still have a nutrient deficiency. Garden centers have a huge selection of either inorganic or organic fertilizers. Fish emulsion and fish meal are often sold as organic fertilizers. Most of my garden friends, myself included, fertilize with a combination of both, organic and inorganic. When following label directions and applying correctly, both inorganic and organic fertilizers are safe for plants and the environment. I want to address a misconception that organic fertilizers are safer than inorganic fertilizers. Misuse of any fertilizer, organic or inorganic, can contribute to pollution, nutrient deficiency, and plant burn. So choosing organic fertilizer does not mean that this is the safest, most environmentally friendly option. The safest option is to know your soils fertility (soil test) and to add the proper product, at the proper rate, and at the proper time. Fish emulsion and fish meal contain the nitrogen, phosphorus and a few micronutrients needed by plants. Fish emulsion is made from the fluid remains of processed fish (sadly, our little beta fish has some fluid remaining). Fish meal is made from whole fish, fish bones, and fish innards. It’s a powdery material that remains after the fish oil and water have been pressed and ground out of the fish. Using fish as fertilizers was practiced by the Native American Indians. As the Pilgrims settled here, the Native American Indians taught the Pilgrims how to increase their crop yields by incorporating fish in the soil. Take a lesson from the Native American Indians, next time you have a fish floating in the tank, consider it a source of plant nutrients and not gross! Excuse me sir, do you know anything about Fertilizer?